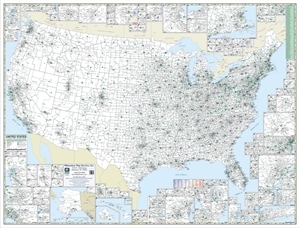 United States County & Town Map 40" x 31"
United States Map outlining and naming each state, outlining and naming each county & showing all cities and towns of 10,000 population and above. Includes insets of all the major cities. Available in black & white or full color. United States County & Town Map 52" x 40"
United States Map outlining and naming each state, outlining and naming each county & showing all cities and towns of 5,000 population and above. Includes insets of all the major cities. Available in black & white or full color. 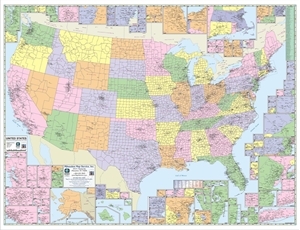 United States Map outlining and naming each state, outlining and naming each county & showing all cities and towns of 2,500 population and above. Includes insets of all the major cities. Outlined in green, and labeled, are the 3-Digit zip code boundaries. Available in two sizes: 63" x 48 and 53" x 40". 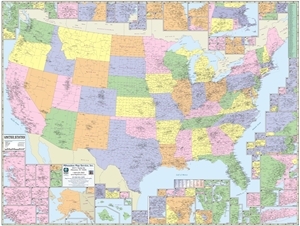 United States County & Town Map 63" x 48"
United States Map outlining and naming each state, outlining and naming each county & showing all cities and towns of 2,500 population and above. Includes insets of all the major cities. Available in black & white or full color.